Photo: © Harvard’s Wyss Institute. In an 11 September press release, The Wyss Institute for Biologically Inspired Engineering at Harvard University announced that it has been awarded a first-phase $2.9 million follow-on contract by the Defense Advanced Research Projects Agency to continue development of its Soft Exosuit as part of DARPA’s Warrior Web program. Harvard’s solution, created by a team led by Wyss Institute Core Faculty member Conor Walsh, Ph.D., is Soft Exosuit. It has been designed to overcome the challenges of traditional heavier exoskeleton systems, such as power-hungry battery packs and rigid components that can interfere with natural joint movement. It is made of soft, functional textiles woven together into a piece of smart clothing that is pulled on like a pair of pants and intended to be worn under a soldier’s regular gear. Through a biologically inspired design, the suit mimics the action of the leg muscles and tendons when a person walks and provides small, but carefully timed assistance at the joints of the leg without restricting the wearer’s movement. “While the idea of a wearable robot is not new, our design approach certainly is,” said Walsh, who is also an Assistant Professor of Mechanical and Biomedical Engineering at Harvard’s School of Engineering and Applied Sciences (SEAS) and founder of the Harvard Biodesign Lab. nouncement of the recent award is the first of what could be a two-phase contract, which will enable Walsh and his team to build upon their earlier work, which was also funded by DARPA, which demonstrated the proof-of-concept of the Soft Exosuit. Inspired by a deep understanding of the biomechanics of human walking, the Soft Exosuit technology is spawning the development of entirely new forms of functional textiles, flexible power systems, soft sensors and control strategies that enable intuitive and seamless human-machine interaction. 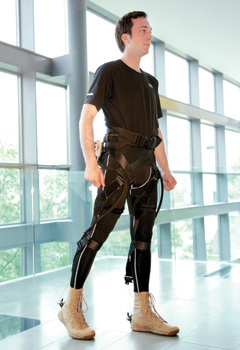 In a current prototype, a series of webbing straps positioned around the lower half of the body contain a low-power microprocessor and network of supple strain sensors that act as the “brain” and “nervous system” of the Soft Exosuit, respectively — continuously monitoring various data signals, including the suit tension, the position of the wearer (e.g., walking, running, crouched) and more.